There is little evidence either way whether acne and your daily diet has a connection because food allergies and skin sensitivities effect everyone differently. A healthy diet will provide the body with good nutrition, certainly improving your overall well-being and possibly helping to prevent acne to an extent. Since acne varies in many forms and degrees for everyone and reactions to food is extremely individual, there may be certain acne causing foods that cause flair-ups in your skin so it helps to keep a list of problem foods to avoid. Instead of highly processed foods and sugared sweets, try incorporating more foods rich in omega-3 fatty acids into your balanced diet, as well as plenty of fresh vegetables, and antioxidant fruits. Many forms of acne types can actually be caused by imbalances in male (androgens) and female hormones (estrogens). Since acne is influenced by hormones, teenagers can have a challenging time because puberty causes hormonal levels to rise. During this time of constant changes and high hormones this hormonal imbalance sends messages to signal glands to start making more oil. Women may suffer hormonal acne experiencing persistent breakouts the week before their menstrual cycle, pregnancies, and can even cause problems after menopause. Consider the importance of Vitamins, along with a good diet in the prevention of acne. Due to unhealthy eating habits, most people do not get the proper amount of vitamins, minerals, and herbs that are important for your body to function properly and maintain a balance. To promote a healthy complexion, speed up skin renewal, and flush out free radicals and toxins from your system, your body needs a balanced nutrition source to keep your body well nurtured. The lack of antioxidants can cause skin problems and possibly be a factor in causing acne. Many vitamins play an important role preventing infections in the skin such as Vitamin A, C, E, B5 and minerals, chromium and zinc. Although almost everyone gets blemishes to some degree, some people are associated with an increased risk of developing acne if a person has a parent or sibling with a history. 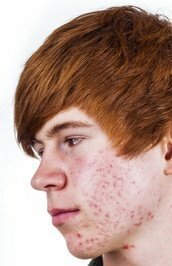 When acne is inherited it may help to study the family patterns, type, and the severity of the acne to help determine the best acne treatment options. Stress can aggravate acne and trigger a flare-up and has been known to be the culprit when it comes to adult acne. High stress levels may also worsen the disease in teens by producing more hormones making the sebaceous glands produce more oil and make skin extra oily.